Thermo Scientific iCAP TQ ICP-MS offers advanced interference removal for analyzing challenging matrices while delivering reliable, reproducible data. Laboratories working with challenging matrices can now benefit from a new triple quadrupole inductively coupled plasma mass spectrometer (ICP-MS) that is designed to combine power and simplicity in a single instrument. The easy-to-use system, developed to support ultralow detection limits, offers advanced interference removal capabilities designed to overcome interferences common in challenging matrices. It is also designed to provide reliable and reproducible data for a range of applications. 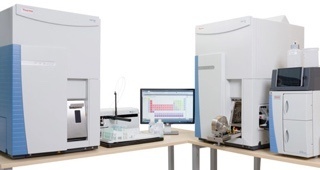 The new iCAP TQ ICP-MS allows users to switch between single and triple quadrupole modes in a single multi-element experiment so that laboratories can keep their existing workflow as well as add new capabilities over time. When combined with Thermo Scientific Qtegra Intelligent Scientific Data Software, an intuitive user interface and the Reaction Finder tool, researchers can reduce time-consuming method development. The system requires minimal user maintenance and includes QCell flatapole technology, a small volume collision/reaction cell with flatapole rods, and a dedicated gas distribution unit for lab safety and maximum flexibility. It also features self-aligning sample introduction components for reproducibility and an ergonomic benchtop design with a compact footprint that saves valuable lab space. Finally, by integrating control of peripherals, the system is designed for outstanding productivity with minimal errors — targeting consistent performance and reliable data.